Barnabas & Co., is a unique look at the actors who catapulted Dark Shadows to its position as a cult phenomenon. Featuring cast biographies, trivia, and a small gallery of photos, the book is now available online. Click here to buy it now on Amazon.com. Big Lou, the biography of Louis Edmonds (Roger on Dark Shadows) was first published in 1994. After Louis' death in 2001, I revised and expanded it, conducting extensive research and further interviews with his co-stars. The new, memorial edition is now available online: Click here. For more information, about Big Lou, click here. The Dark Shadows Collectibles Book, a comprehensive, fully illustrated look at the games, toys, puzzles, books, and other official DS merchandise was published by Pomegranate Press in 1998. 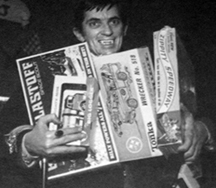 Along with photos of the various DS collectibles, the book contains several unusual publicity photos of Jonathan Frid on a shopping spree in his Barnabas costume, including the one below. The Dark Shadows Collectibles Book can only be purchased at the Pomegranate Press website (and at Dark Shadows Festivals). For more information, click here. 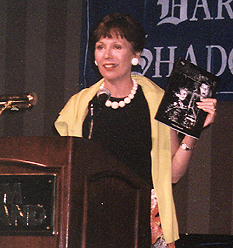 DS star Kathryn Leigh Scott introduced The Dark Shadows Collectibles Book at the 1999 DS Festival. It was published by her company, Pomegranate Press. My earlier DS books, The Dark Shadows Collectors' Guide, Frozen Summer, Conversations, Victoria Winters, and Seeking Shadows are currently out of print, but copies occasionally turn up on Ebay and I may reprint them at some point. 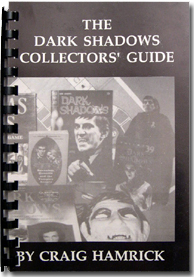 In 1991, I self-published my first DS book, The Dark Shadows Collectors' Guide. It includes photos of nearly every DS collectible that had been issued at that point -- including the covers of all the Gold Key comics and the Paperback Library novels, and rare items such as The Horror Head Pillows and the Barnabas Halloween costume. There are also chapters based on exclusive interviews I conducted with Kathryn Leigh Scott, Jonathan Frid, Lara Parker, and Dan "Marilyn" Ross (author of the DS novels). Some of the text from this book was revised and included in The Dark Shadows Collectibles Book (see above), but the interviews were removed. Frozen Summer is a short novel, set at Collinwood in 1990, with David Collins' son, Brent, as the main character. Shortly after Brent arrives at his ancestral home, he is drawn into a mystery surrounding the disappearance of his cousin Barnabas Collins. Conversations is a collection of transcripts of the cast interviews I conducted for The Dark Shadows Collectors' Guide.  Victoria Winters, a fanzine featuring short stories, articles, and artwork focusing on Collinwood's naive governess -- created by some of the best writers and artists in fandom, including Jeff Thompson, Connie Jonas, Sherlock and more. 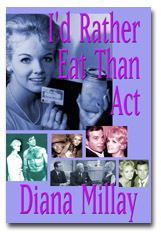  I'd Rather Eat Than Act, a cookbook by Diana Millay, which was first published by IRETA Press in 1995. An updated paperback edition debuted at the 2004 Dark Shadows Festival and is available at online booksellers Amazon.com and Barnesandnobel.com.  The Power of Halloween, Diana Millay's intriguing history of the spookiest day of the year, which is available on Amazon.com. For more information, visit Diana's website.  In 2005, I worked with Marie Wallace on her first book, On Stage and in Shadows, which debuted at that year's DS Festival. It contains interesting stories about her long and diverse stage career as well as rare photos of Marie and many of her costars, including Jackie Gleason, Bert Lahr, Ethel Merman, Gwen Verdon, and many more. Read more about the book on Marie's website -- including some great previews, including fun stories about her longtime pal Ruth Buzzi, with photos! • One of my best friends, Lucille Ball expert Michael Karol, has written a terrific series of Lucy books, and he's tapped me to edit them. I love Lucy -- not quite as much as he does -- so it's been fun working with him on these books. We've also collaborated on a website and book series featuring trivia about TV classics, including The Golden Girls, The Brady Bunch, Gilligan's Island and many others. Click here to visit the TV Tidbits website. I'm pretty sure that Diana Millay was the first cast member to get her "name-dot-com" registered and post her own site on the web. It was about 1995, so the whole idea of websites was still relatively new, and I was just learning how to design sites, so dianamillay.com was one of the first online projects I worked on. Since then I've also worked on davidselby.com, mariewallace.com (I got Marie started, and she took over and has had a lot of fun maintaining her own pages, writing updates, adding photos, etc. ), and laraparker.com. 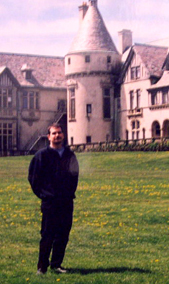 In 2005, I developed a couple more additions to the Dark Shadows Online group of sites: Nancy Barrett Online and Denise Nickerson Online -- but a medical crisis landed me in the hospital for a big chunk of the summer, so they're still a bit sparse. I'm working with Nancy and Denise to add a great deal of content to both sites in early 2006. "Each year, more than 100,000 Americans are told they have colon cancer -- the second deadliest form of the disease. In 2002, a few days after my thirty-sixth birthday, I became one of those people." 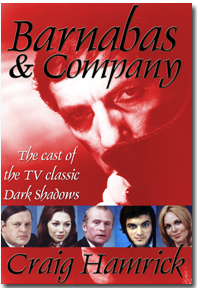 Dark Shadows Dan Curtis Productions. All rights reserved.